Illamasqua's Eye Colouring Pencils aren't one of their more famous products (the ones that seem to get the most attention are their blushes, lipglosses, lipsticks, and eyeshadows), but when I was at the Illamasqua store opening at Takayashimaya, I thought it would be good of me to do some quick and easy swatches of the Eye Colouring Pencils, because swatches are always good, right? Illamasqua calls these "creamy", and I agree. 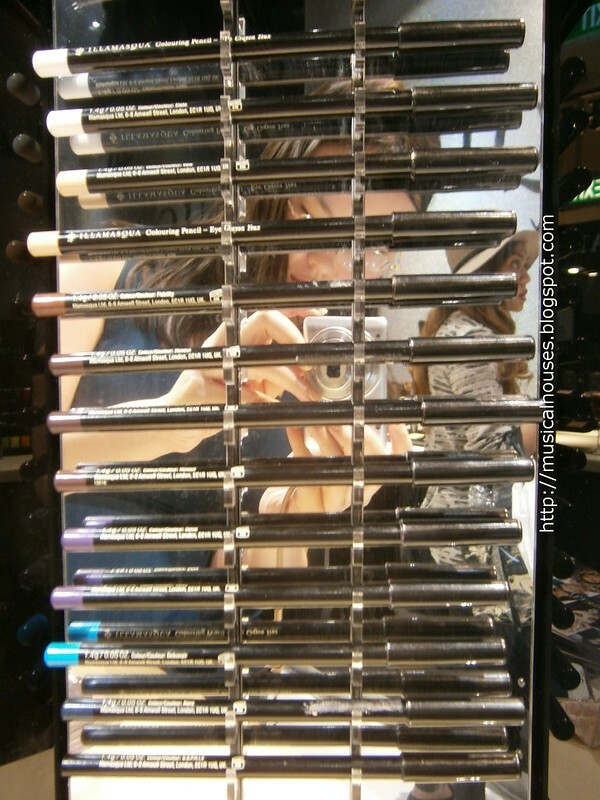 These are creamy and pigmented, and really useful for eyeliner, or even eyeshadow if you are able to handle colouring your eyelid with a pencil. Illamasua describes these as "long-lasting", and I'd have to disagree with that - I'm not sure if it was my arm chemistry not hitting it off with these eye pencils, but I found that they didn't seem to "set", and thus seemed prone to smudging/rubbing. These are also mostly matte in finish - no glitter or shimmer to be found. Pardon the poor lighting, I was swatching indoors in the shop itself, and this was unfortunately the best I could do. Still does a pretty decent job of showing the colours, in my humble opinion! 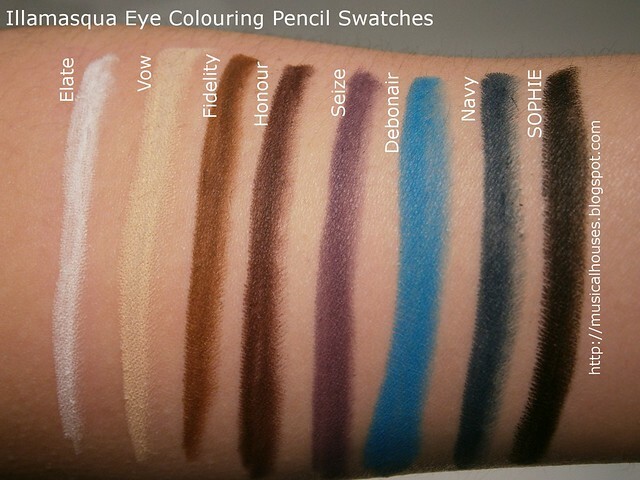 For the most part, the colour descriptions by Illamasqua for the Eye Colouring Pencils are also spot on. Elate is described as "pure white", and yup, that's basically it. Vow is a "fresh cream", and that's spot on - this is an light eggshell kinda beige. Good for an all over lid colour for lighter girls. Fidelity is described as a "milk chocolate", and to me, it's a warm medium brown. Honour is a "plum chocolate", and this is a deep cool-toned brown with a hint of purple. Seize is a "blue violet", and again, this is a cool-toned deep purple shade. Debonair is a "sky blue", and I thought it wasn't quite as light or as pastel as what I imagined sky blue to be. I'd call this a cyan blue. Navy is a "navy blue". Yup, nothing more to say. SOPHIE (S.O.P.H.I.E. really, but I didn't put in the dots) is a "jet black", and again, I don't quibble with the description. My quick impressions (just based on my limited experience with the product doing swatches) are that these would be great if they would set and not smudge so much. But I suspect the formula is deliberate, because Illamasqua does encourage the use of the pencils beyond eyeliner - you can also smudge them into the crease or blend across the lid. Maybe a primer may help with that issue. Wow! SO pigmented!!! Very impressive! I need that sky blue! So pretty!